In an effort to find additional mind stimulating toys for Balki, we purchased the Toys ‘R’ Us treat dispensing toy. This might have been our biggest disappointment yet. It appears durable, but looks proved to be deceiving with this so-called treat dispenser. We usually let Balki play with a toy for awhile before snapping a picture of it, which was a tragic decision in this case. Not only did he get the treats out instantly, but he also destroyed the entire toy within minutes. It was shredded by the time we got the camera ready. The holes where the treats should come out of were especially easy to rip, which seems like an odd design for this type of toy. After more than five months of buying dog toys, one finally went in the trash. I never thought I would throw away a toy so quickly, especially after sewing and restuffing one of his first plush toys. 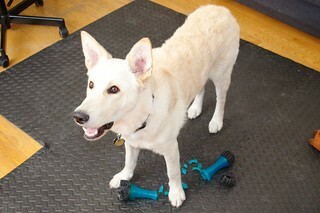 Balki enjoyed his moments of destruction, but it was an expensive few minutes for us. Lesson learned. First the Treat Triad Disappointment and now this. No wonder the original Kong toy has been such a success.